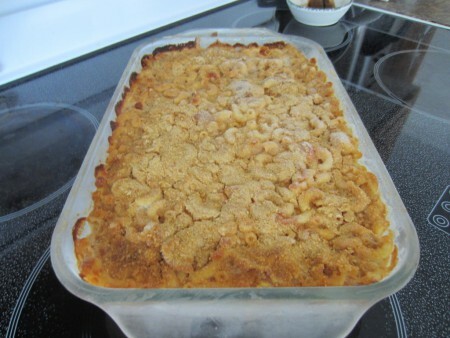 By using whole grain macaroni and by exchanging the crushed corn flakes in this recipe for crushed whole grain bread crumbs, you can make this recipe a healthier choice. I save all of our whole grain crusts, drying them in the oven and blend them into bread crumbs. I store them in a container or plastic bag in the freezer. The first time I made this recipe, I served it with some Farmer’s sausage pieces fried in coconut oil. It was great. Then the other day I decided to fry extra lean hamburger and put that at the bottom of the baking pan. This way we had the whole main meal in one pan and it as well tasted very good. I baked a double recipe, froze one for another time and we enjoyed the other. OUR BODIES NEED HEALTHY FAT EVERY DAY! I used coconut oil as part of the fat in the recipe seeing it is a healthier fat. We are always trying to use more healthy fat in our daily meals, and we have read how coconut oil is good for our brain and Parkinsons’ as well as other diseases. As we read about studies done and the recommended nutrition, we realize that more healthy fat is good for us. We now use more coconut oil in much of our cooking and baking, butter & coconut oil in our baking and dressings made with extra virgin olive oil in salads. When I think of all the margarine I used to buy and use, I can see how we were using the wrong kinds of fats on a regular basis. Serve this dinner with a kale or cabbage salad using a homemade dressing with extra virgin olive oil or avocado oil for some excellent added nutrition. 2 ½ cups macaroni – cook, drain, rinse and drain again. Whenever I have dried bread, I just save it & continue to put it into the oven after baking other foods. When I have enough and it is dry, I blend it until fine and store it in the fridge to use in a recipe like this or when making meatballs. Brown hamburger, onions and minced garlic. Put in the bottom of a 9 by 13 inch cake pan. Spread the cooked macaroni over top. Melt butter, coconut oil and stir in flour and milk. Mix until smooth. Add cheddar cheese. Pour this over the macaroni. Sprinkle crumbs over the top. Cover with foil and bake 45 minutes at 350 º F. Remove foil and bake another 6 or so minutes. Serve & Enjoy! Winnie.